In this modern world, Analog Electronics devices are becoming less popular and digital electronics components are becoming more advanced and popular day by day. Home devices control system is also an example of modernized digital world. People are using cellular mobile phone network to communicate each other. GSM modules are basic elements of these phone networks. GSM stand for global system of mobile communication. It is also used in many electronics projects among engineering students and also very popular in industry. GSM based projects are used to control devices through mobile from remote locations. For example you want to control any machine from remote locations using your mobile phone, Can you do it? The answer to this question is yes. We can easily turn on and turn off devices using GSM modules and mobile phones. By using above concepts, home devices control system is designed to control home devices from mobile phone. How to use GSM module for home devices control system? The basic concepts of this project is to turn on or turn off home devices like fans, lights etc through mobile phone. So SMS is used for this purpose. SMS communicates information between two devices. GSM module is kind of mobile phone. It have built in subscribers identity module i.e. SIM. GSM module is connected with microcontroller. GSM module interfacing with microcontroller is not difficult task. 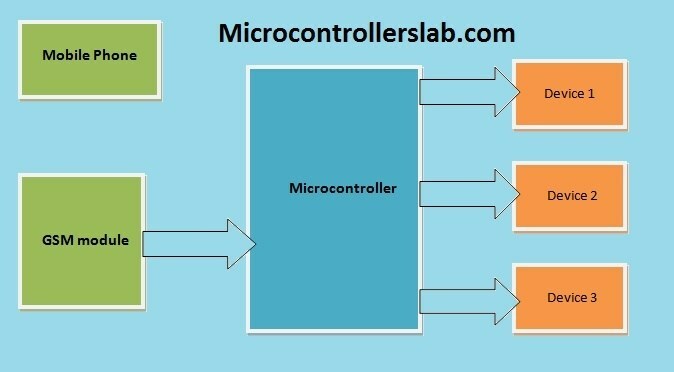 Control devices are also connected with microcontroller. I will explain it in later part of this article. 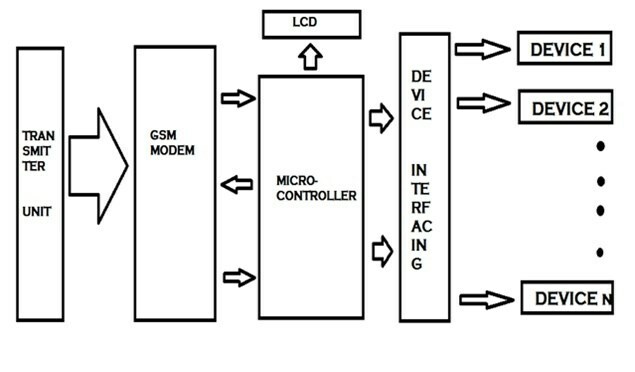 Microcontroller receives information from GSM which is sent from mobile. According to information received by microcontroller, it turns on or turns off home devices. Basic block diagram of home devices control system is shown below. Following are the main components used in home devices control system. GSM module: It is one of the main components of this project. It is interface with microcontroller which receives information from GSM and after reading the information; it turns on or turn off devices with the help of relay driver circuit connected with it. Serial communication is used for interfacing between two devices. SIM 300 modules are operating on 900MHz and 1900MHz frequencies. AT mega 16 Microcontroller: Microcontroller is a kind of minicomputer which is used to perform small function of computers. It is basically a complete processor integrated on a small chip but it has less memory, less speed and processing speed than high speed processors used in computers. But microcontrollers are designed for specific applications in embedded system projects. They are used in many embedded systems applications. The major difference between microprocessor and microcontroller are size, cost and processing speed. In this project microcontroller is main components, which receives information in the form of message and after reading message it make decision either to turn on or turn off device through relay driver circuit. Liquid crystal display: 16*2 LCD is used. It has 14 data pins and 2 pins for LED lights. LCD is used to display status of home devices control system. The main objective of LCD in home devices control system is to display on screen which device is on or which device is off. So you should know how to interface LCD with microcontroller. Relays: Electromechanical relays are used as a switch to provide isolation between two circuits. Relays are used to isolated high voltage devices from microcontroller. Because It operated only on 5 volt. Above 5 volt microcontroller may burn completely. So relays are used to isolate them. Microcontroller energizes the relays by providing those signals through transistor. So It is very important to know how to interface relay with microcontroller. There are many types of relays available in market but we are using single pole double through relay. ULN2003 relay driver circuit: Microcontrollers cannot provide current more than 3mA from output pins. So we need to use a method to increase current value of microcontroller signal which is given to relays. Relay driver circuits are used for this purpose. ULN2003 relay driver circuit is dedicated IC design for such applications. 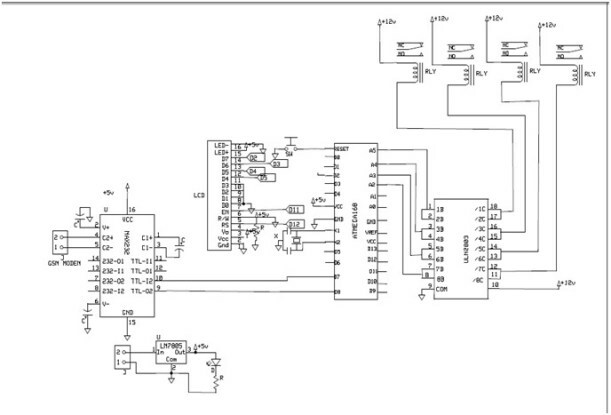 We can also design using transistor but it is better to use dedicated IC for this purpose. Basic block diagram of home devices control system is shown below. Transmit unit at the most left side is mobile phone which send information through shot messaging service i.e. SMS to GSM modem. GSM modem receives information and transfer this information to microcontroller through serial communication. Serial communication is type of communication in which data transfer bit by bit to microcontroller. Unlike, parallel communication which transfer all bits at a time. 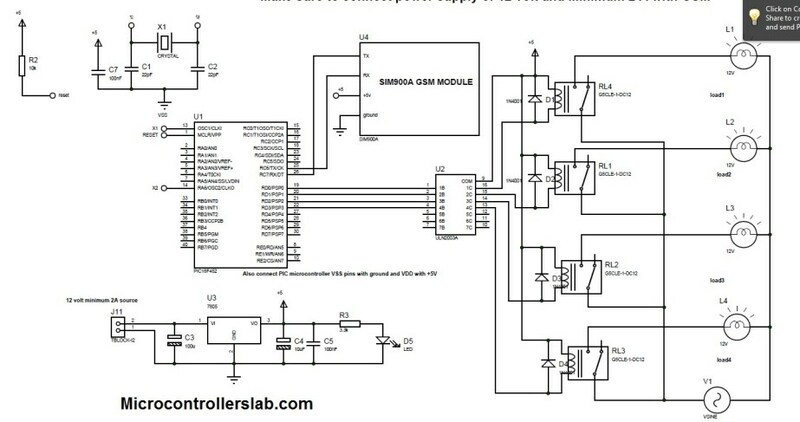 Microcontroller receives data and makes decision according to program written inside it and after making decisions microcontroller energize or de-energize relays through relay driver circuits. In other words, it turns on or turns off home devices. This is how home devices control system works. It can be used for remote locations devices control. It can also be used to save energy in countries which are victims of energy short falls and load shedding. To write code for this project, you should know how to interface GSM modem with microcontroller? How to receive SMS? How to send SMS using GSM Modem and microcontroller? How to interface relays and LCD? I think, if you know how to do above tasks, you can easily write code for this project. I recommend you to write your own for this project, but if you need code for this project contact me through email or comment on this post. Thanks keep sharing this post with others. Remember code is not free of cost. how to use camera for speed trap project using PIC16F887 microcontroller?